Earlier this week, Beth Kanter wrote about how to translate social listening into good twitter conversation that supports your objectives, riffing on David Lipscomb’s Social Messenger Framework — one of the communications planning tools that he’s made available at RedPen21.com. 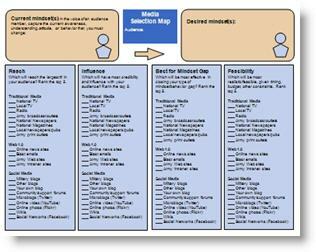 One document that caught my eye in particular was Lipscomb’s Media Selection Map, designed to help you figure out which communications channels — offline and online — to choose for a particular purpose. It all starts with your target audience, defining the “current awareness, understanding, attitude, or behavior that you must change” and, of course, the mindset you’d like them to have. David Lipscomb suggests writing down the existing mindset “in the voice of an audience member” — which I think can be a powerful way to move out of the usual mindset that we can get trapped into, simply because we’re so familiar with our organizations’ missions and messages. But how can you capture that audience voice? See what Beth has to say about listening on social media — it really is the critical first step in any communications plan. Record what you’re “hearing” about your cause or organization, so you’ve got concrete information to work with in planning. In fact, you might even go so far as to copy-and-paste the actual words that people are using into a simple spreadsheet, noting the dates and sources, and keep adding to it as you go along. Read through your collection of quotations every once in a while, from top to bottom, to firm up your grasp of the awareness levels and prevailing attitudes, and to track any changes over time. Reach — which media will best reach the largest number of people in your target audience? Influence — which will have the most credibility or influence with your audience? Best for mindset gap — which will be most effective in closing the mindset gap or changing the behavior you want to affect? Feasibility — which will be feasible and realistic, given the timing and your budget or other resources? The planning tool lists a variety of media types — Traditional Media, Web 1.0, and Social Media — under each of those four headings. In each column, you’re asked to rank the top five choices. When the exercise is completed, look across the page and see where your ranking points or checkmarks are clustered — that’s the logical place to begin! Check out the Resources page at RedPen21.com, and see which of the other communications planning tools there might be useful for your organization. Are there any planning tools and resources you’ve found that you can recommend, especially those that would be suitable for smaller non-profits who are tackling a new communications plan with a limited budget? Please share your links in the comments!